Both dumbbells and the barbell contribute to fabulous shoulders. Shapely shoulders are one of your best accessories. Basic strength training exercises target this set of muscles and can sculpt them beautifully with consistent work. Several exercises are effective for working the muscle group with either dumbbells or a barbell. Though the shoulder is easily identified as the bulge at the top of the arm, there are actually three separate muscles that make up this shapely curve. The main muscles of the shoulder are the front, side and rear deltoids. Compound movements hit multiple heads of the muscle in one movement, while isolation exercises target each of the muscles individually. Overhead presses effectively nail the front and side deltoids in a single movement. The major difference between performing presses with a barbell or with dumbbells is the range of motion. 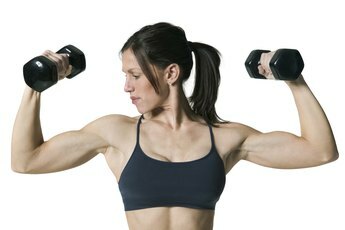 Dumbbells allow for a greater range of motion since they start on either side of the head and have a clear flight path through the full range of motion. With the barbell, there is a tendency for the head, or even the unsuspecting nose, to get in the way since the motion with the barbell starts below the chin at the collarbone. However, performing presses with a barbell provides a more stable platform for the motion and allows you to move heavier weight. Front raises target the front deltoid. With the arms straight the front deltoid is forced to engage in order to lift the arm. Since the front deltoid is the smallest of the three muscle sections, there’s only so much weight the muscle can move. Though front raises can be performed with a barbell, a certain level of strength may need to be achieved before playing with the barbell in order to avoid injury. Additionally, the barbell allows for only an overhand grip with the knuckles facing up. Dumbbells allow for either an overhand grip or the variation of a hammer grip where the dumbbells are held vertically with the knuckles facing out. Additionally, dumbbells allow for the variation of working each arm individually in an alternating pattern. Side lateral raises and rear deltoid flyes are best worked with dumbbells since the physics of the motion — the arms moving laterally away from the body in opposite directions — doesn’t really work with a barbell. Though some exercises may be more easily performed with dumbbells, there is a place for both dumbbells and the barbell in a total shoulder workout package. It’s worth exploring both options to keep your muscles alert and to keep your workout unpredictable, as is playing with the amount of weight you may be able to move with one or the other. Keep in mind the shoulder is a delicate joint responsible for a great deal of stress and movement in everyday life, so always start any shoulder workout well warmed up and stretched. Start conservatively with your weights until you’re well familiar with the movement, and always ask a fitness professional if you're unsure of or are unfamiliar with any particular exercises. Do Shoulder Shrugs & Upright Rows Work the Same Muscle? What Muscles Do Barbell Military Presses Work? Do Shoulder Presses Work the Entire Deltoid? How Much Weight Should You Use on Front & Lateral Raises? What Kind of Pullups Work the Front Deltoids?